I had an annoying bit of malware called "en.4yend.exe". I could not get rid of Yahoo as a search engine in my Chrome browser. No matter how many times I made Google my default search engine It would not change. I tried everything I could by followig Chrome instructions and others also to no avail. Then I spotted a recommendation for UnHackleMe (which gives you RegRun). I tried it and with one scan the problem was gone. This is a great program which I have been using for 5+ on XP up. Anybody who doesn't like it and gives a 2 is simply too lazy to checkout the features. Interface is not great but so what? Dmitry is very responsive to user questions and suggestions. Kissesfromitalia, why do you talk such bulls***? RegRun is really useful and powerful program. I think you just didn't ever try it. Yes, its interface is not as good and clear as it should be, but RegRun can help you in case of disaster, moreover, it can help you to PREVENT disaster. So, I'm really pity when I see such stupid comments like yours. one of those must have tools! 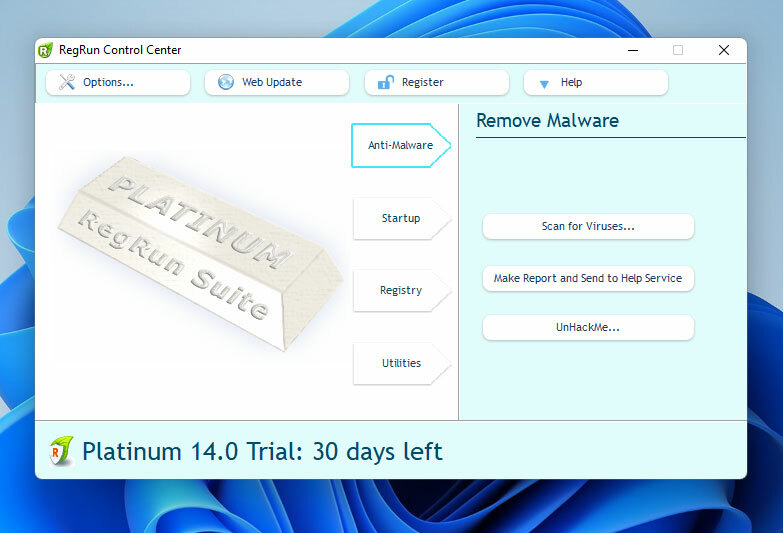 RegRun is one of THE most powerful security programs that you can have on your computer. It provides layers and layers of diverse protection from rookits, trojans, and other malware. Moreover, it can alert you to zero-day malware -- malware so new that there are as yet no signatures that cover it. It *plays nicely* with any and all antivirus, antitrojan, & antispyware programs. It complements them but does not duplicate their functions. Regrun offers absolutely unique protection for the high-risk surfer, &/or the paranoid. Be aware- RegRun is an extremely complex program with many many functions. It is NOT good-to-go straight out of the box. And it is most definitely NOT a set-it-forget-it program. Instead, it is a very powerful tool for use by those who know what they are doing, or who are ready to work hard to learn. Have any of you actualy tried this on a rootkit? sony's copy protection. Now I want the poaster that says you can get the same features in freeware to tell me what those programs are. I have tried almost them all. The only reason I give a 4 is because of ease of use. I was affraid it might be complex for an untrained home user. Quite complicated at first look, with a few different interfaces at the start (run it you'll see what i mean!. Has good features, but not much that others dont offer for free. Oh yeah, it is not freeware, it's a 30 day trial!.